Sleeping has evolved to become such a luxury and no longer a life necessity that it used to be. People seldom get to sleep all eight hours of uninterrupted sleep like we used to because distractions are everywhere keeping us away from our bed and make us stay up until the early morning hours. We can’t get enough of the web and social media and it has greatly changed our sleeping habits too. Most people nowadays thrive at night partly because the Internet connection is faster and you don’t have others to compete with the bandwidth that slows down the speed. Back then, people had nothing better else to do once night time falls so they simply sleep. Even the television did not have enough shows to air until cable TV came. But now, you won’t run out of things to do and see on the web. As long as you have a fast Internet connection, you’re free to do just about everything under the sun (under the moon, in this case). However, there are also other things that keep people up at night and it is far from enjoyable, unlike social media. Medical conditions like sleep apnea is a terrible malady since it doesn’t only bother the person suffering from it but the patient’s significant other (partner or spouse) since the snoring is as terrible as the accompanying risks of such a diagnosis. Untreated sleep apnea can increase blood sugar, blood fat, stress hormones, and blood pressure in just a few days, new research finds. The study, published in the Journal of Clinical Endocrinology & Metabolism, adds further support for the consistent use of continuous positive airway pressure (CPAP), a machine that increases air pressure in the throat to keep the airway open while a patient sleeps. “This is one of the first studies to show real-time effects of sleep apnea on metabolism during the night,” says Jonathan Jun, assistant professor of medicine at the Johns Hopkins University School of Medicine and the paper’s senior author. 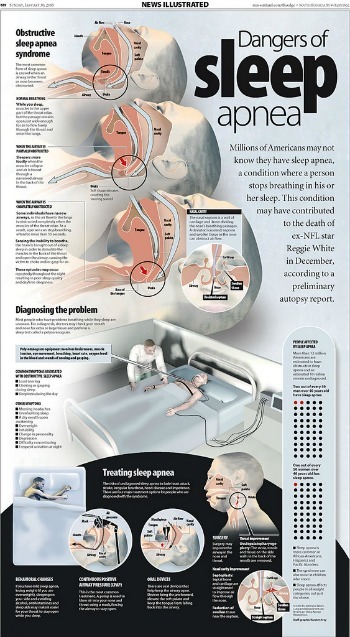 Obstructive sleep apnea affects 20 to 30 percent of adults, previous studies showed. It occurs when the upper airway closes off during sleep, temporarily interrupting breathing. Sleep apnea is a major health risk since it predisposes you to other equally deadly conditions like heart disease and diabetes. 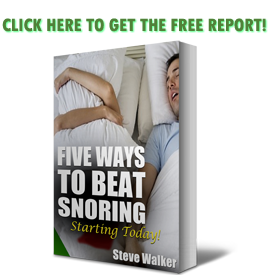 It is a major bother too because of the loud snoring and the mere fact that a person suffering from sleep apnea literally stops breathing many times during his/her sleep. The death last year of actor Carrie Fisher, best known for her role as Princess Leia in the Star Wars franchise, was due to sleep apnoea and other causes, the Los Angeles County Coroner’s Office said in a statement on Friday. Fisher died aged 60 on December 27th, four days after she became unresponsive on a flight from London to Los Angeles and was rushed to a hospital. 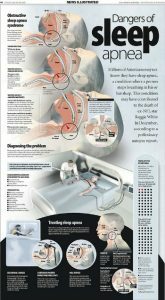 You can really die from sleep apnea especially if you are older and already battling with pre-existing health conditions. Losing sleep is the least you want to suffer from as you age but that’s what you get with sleep apnea. Moreover, just be reminded again of the fact that your breathing temporarily stops if you have sleep apnea. It’s a deadly symptom for patients with cardiac conditions and death may be inevitable in a short span of time. So, why face such a risk if there are interventions at your disposal that won’t just relieve you of the annoying symptoms of sleep apnea but save your life from such a great danger too? Most patients aren’t thrilled with conservative sleep apnea treatments like CPAP for this reason: https://snoringmouthpiecereview.org/why-a-cpap-machine-is-probably-not-for-you. But do not lose hope because there are alternatives you can try that may not be as effective as CPAP but still good enough to save you (and your partner) from sleepless nights and hopefully extend your life to. An example of such a device is this: https://snoringmouthpiecereview.org/zquiet, which is easy to use and quite affordable too, so sleep apnea becomes a thing of past for you.